"Tinnitus Resolved Report Reveals The Reasons Why You Most Likely Developed This Annoying Condition But More Importantly How To Banish The Noise Once And For All...Drug Free!" The Report Is Absolutely Free. No Strings Attached And Nothing Is For Sale. You Will Discover Everything You Need To Know To Quiet The Noise Once And For All! 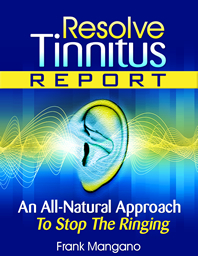 Enter Your First Name And E-Mail Address Below To Receive Your Free Tinnitus Report! By entering your name and e-mail above, you agree to receive Frank Mangano's Natural Health Newsletter, which is jam-packed with free and useful health information you can use to improve the quality of your life. The newsletter is free and you can unsubscribe at anytime!